I am Michelle, mother to Audrina and soon to be Clarissa! In the picture I am wearing my 21 month old daughter on my back in an Oscha Nouveau Raven wrap and am 36 weeks pregnant with my second daughter. That day we were out taking maternity photos. My husband and my good friend (who photographed us) were there. We live in Oahu, Hawaii and were at the Wahiawa Birthing Stones. In the background is Kolekole pass. We were just enjoying the sunshine that day and all being together. We wear our babies for many reasons. We wear them because they enjoy it. They like being close to us, they like being held, they enjoy seeing the world from up high. And it saves our arms! I wear my children while I do chores around the house, to get them to fall asleep for naps, to keep them out of dangers way, while I shop, when we go out to eat, at the zoo, everywhere! Doing practically anything! We wear our babies because it brings more joy into our lives. I love this carrier/wrap! 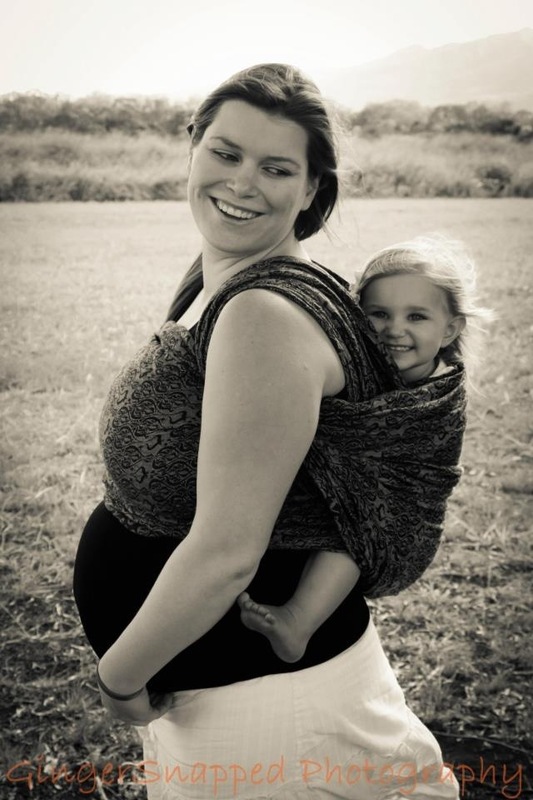 I currently use a baby k’tan, but It doesn’t allow for carrying on the back… what wrap is this? Also, I love the theme of this blog. Awesome stories!